The Night of Wheels at Oakshade Raceway made a lot of kids happy with free new bikes and Late Model driver John Henry happy because he picked up his second Oakshade Raceway UMP Late Model Feature win. Henry started on the outside of the front row, but was pushed up high in first set of corners on the first lap. He ended up getting shuffled back to about fourth. Pole starter Ronnie Perrine Jr. opened up a good lead the first half of the the race. By lap 16, Jon Henry had worked his way back up to second and started to reel in Perrine for the lead. Three laps later, Henry took command as Perrine slipped back to second. The Ada, Ohio driver went on to pick up his second feature win of the year in the caution-free race. Rusty Schlenk started 21st and did an incredible job finishing second, just a few car lengths behind Jon Henry. Ronnie Perrine Jr. ended up third followed by Tyler Boggs and Casey Noonan. Oakshade UMP Sportsman point leader Matt Lindsey led the entire distance of the UMP Sportsman Feature event after starting on the outside of the front row. Brian Fisher was running in the top five and then slowed on the track bringing out one of the numerous caution periods. Lindsey managed to open up a large lead after each restart, but a yellow with just two laps to go set up an exciting finish. Mike Jessen and Brett Miller pressured Lindsey for the lead in the final two laps, but Lindsey held off the challenge to pick up his fourth feature win of the year. Jessen finished second with Miller taking third. Jerry Urbanowski and Brice Luttrell were the rest of the top five finishers. The UMP Bomber A Main produced one of the most exciting finished of the night with some great racing throughout the race. Steve Morris started on the pole and fought very hard to hang on to the lead the first couple laps. Ron Tolles took the lead away on lap three and then Danny Hogrefe, Steve Morris and Jake Gamber battled hard for second. Hogrefe eventually got up alongside Ron Tolles and the two drives battled side by side for the lead for at least four laps. They exchanged the lead from lap nine to lap 13 until Hogrefe finally cleared Tolles. Last week’s A Main winner Craig Dippman was trying to work his way forward until he spun on lap 14. Billy Brown became a factor late in the race as he took the lead from Hogrefe going into the final turns. Brown slid up in turn four and Hogrefe came back to the inside for a drag race to the finish line. Hogrefe took the checkered flag by just a couple inches over Brown. Jake Gamber finished third and Steve Morris held on for a respectable fourth place finish. Joe Overmyer was fifth. Oakshade UMP Hornet point leader Drew Smith won his heat race earlier in the night and was hoping to find the checkers for his first feature win, but things started off poorly for the youngster when he spun on the first lap of the feature, forcing him to the rear of the pack for a restart. Adam Noonan started inside of row two and wasted no time taking the lead on the first lap with Dylan Herman pursuing him in second. Sixteen-year-old Noonan held off both Herman and Derek Morris to win his sixth feature of the year. Morris got by Herman for second with Drew Smith recovering to finish fourth. Tyler Line finished fifth. Bob Mayer grabbed the lead at the start of the UMP Bomber B Main and led the first nine laps of the race. Fred Burtch was running second, but brought out the yellow on lap 8 forcing him to the rear. Dan Dippman quickly closed on Mayer and took the lead on lap 10. Mayer tried hard to fight back and lost what could have been a second place finish as he spun in the final corner coming to the checkered flag. Jeff Geis finished second followed by Josh Overmyer, Marty Bloomer and Karl Spoores. George Laney Jr. led from flag to flag in the UMP Bomber C Main for his first win of the year. Willie Stites got crossed up trying to complete lap one on the front stretch and collected Devin Goodman in a hard crash that took both drivers out. Joe Heffner closed in on Laney late in the race to challenge for the lead, but Laney held him off and Heffner had to settle for second. Greg Detray started last and finished third followed by Nathan Goodman and Shaun Sharp. The American Late Model Series returns to Oakshade Raceway on Saturday, August 1 for a $2,000 to win show along with UMP Sportsmen, UMP Bombers and UMP Hornets. Gates open at 4pm and racing starts at 7pm sharp. 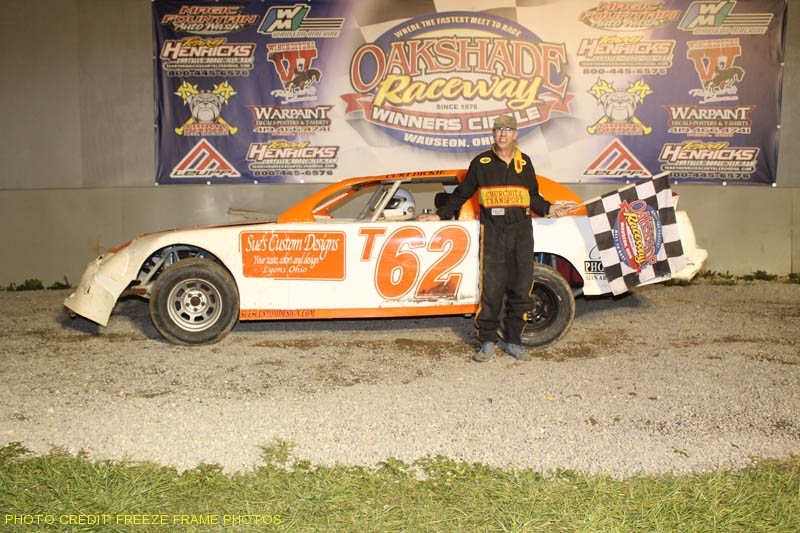 The Oakshade Raceway Late Model point leader, Rusty Schlenk, swept the second ever Push Truck Dual Late Model Feature events on Saturday night, picking up his first two feature wins of the season. Race fans were treated to twice the racing excitement with the two full UMP Late Model Features that each paid $1,500 to the winner. Tyler Boggs started on the outside of the front row and led the first ten laps of the first feature. Schlenk closed in after starting on the outside of the third row and took command on lap 11. Schlenk encountered a close call on lap 18 when Gregg Haskell spun as he was getting lapped by Schlenk. Schlenk pulled away from the rest of the pack in the remaining laps to capture the first of his two feature wins. Tyler Boggs held on to finish second ahead of Rusty Seaver, Rick Delong and Casey Noonan. The drivers in the first feature then got a break as the UMP Sportsman Feature took to the track. The caution flag flew early after Steve Mills bounced off the backstretch wall on the first lap and got into Randy Franks before spinning. Defending Sportsman Track Champion Mike Jessen started on the pole and dominated the race. Jessen had to be a bit frustrated though as the caution would keep coming out and eliminating big leads he had built up. Jessen went on to pick up his first feature win of the year over Bruce Stuart, Brett Miller and Brian Fisher. Brice Luttrell finished fifth. The second of the Push Truck Dual Late Model Features came out next and added to the starting line up were Hillard Miller, who was highest in Oakshade points not to transfer in, and Pete Dotson and George Laney Jr. who both transferred via their finishing positions in the consolation races. The top eight finishers from the first race were inverted for the start putting Dusty Moore on the pole. He would lead the first six laps. Chris Keller fought hard with Dusty Moore for the early lead and Schlenk came up through the field quickly. Rick Delong joined the lead battle going three-wide on lap six. Moore got shuffled back to third as Delong and Keller continued to duke it out. Schlenk joined the lead battle, again going three-wide for the top position with Delong and Keller. Delong was the leader under a yellow on lap 15 when he retired to the pits with left front issues leaving the lead to Keller. Schlenk ducked under Keller after the restart and the two raced hard for a couple laps until Schlenk took over the race lead. Casey Noonan closed in late in the race and put pressure on Schlenk as they raced to the checkered flag, but Schlenk held on to sweep both feature wins. Noonan finished a close second followed by Kevin Reeve, Chris Keller and Tyler Boggs. Todd Silvey was the early leader of a caution-filled UMP Bomber A Main that had some great racing out front. Silvey had to hold off Dan Shaffer as Jim Scout joined the battle making it three-wide for the lead. Silvey’s lead was saved a couple times by some well timed caution flags, but Silvey retired to the pits under one of those caution periods turning the lead over to Dan Shaffer. Shaffer’s lead was short-lived as Craig Dippman marched to the front after starting deep in the field and took the lead and began to pull away. Shaffer would eventually bring out the yellow flag after he fell off the pace and couldn’t make it off the track back to the pits. Dippman went on to and won his third UMP Bomber A Main in the last four weeks. Jim Scout finished second followed by Billy Brown, Dan Plath and Tony Tolles. Last week’s UMP Hornet Feature winner Derek Morris battled with Dylan Herman for the first half of the Hornet Feature with Herman leading each time at the line. Adam Noonan closed in on Herman and began to pressure him for the lead late in the race. Noonan got to the inside of Herman and race him side by side to the finish with 15-year-old Dylan Herman holding on to win his fifth feature of the year. Noonan had to settle for second with Morris slipping back to finish third. Dylan Burt finished fourth and Tyler Line was fifth. Dean Taylor led the UMP Bomber B Main from start to finish even though a hard-charging Jake Gamber closed in and battled for the lead. Gamber got alongside Taylor on the final lap and the two drivers crossed the finish line side by side with Taylor just edging him out. Terry Rushlow started third and ended up third followed by Dan Dippman and Joe Cordes. Marty Bloomer passed Chris Tressler for the lead of the UMP Bomber C Main on lap three, but could not hold off a very fast Joe Overmyer who picked up the checkered flag. Bloomer finished second with Terry Rump, Jeremiah Floyd and Joe Heffner rounding out the rest of the top five finishers. Saturday, July 25th is the Night of Wheels/Scout Night at Oakshade Raceway. Kid’s bikes will be given away at intermission and scouts in uniform get in to the grandstands free for a full racing program of UMP Late Models, UMP Sportsmen, UMP Bombers and UMP Hornets. Gates open at 4pm with racing at 7pm. Oakshade Raceway lived up to its name on Saturday as 58 of the fastest UMP Late Model drivers met to race in the 11th Annual $10,000 to win Birthday Race. The event was also the finale of the grueling UMP Summer Nationals series which entered the final event with Randy Korte and Dennis Erb Jr. in a tight battle atop the Summer Nationals point standings. Jackson Michigan’s Rusty Schlenk started alongside Dennis Erb on the front row of the 60-lap feature event and got the early jump for the lead. Schlenk stretched his advantage over the rest of the field early in the race while Tim McCreadie battled hard with Erb for second. McCreadie eventually took over second position and began to chip away at Schlenk’s lead as both drivers worked through lapped traffic. On lap 33, McCreadie made the pass for the lead and then proceeded to open up a big lead of his own. The only caution flag of the race flew with just two laps to go and tightened the field for a two-lap shootout. McCreadie led Erb, who had taken over second from Schlenk, back to the green flag. No one in the top five was able to advance their position as McCreadie held on to take the checkered flag and the check for $10,000. Dennis Erb Jr.’s second place finish was enough to catapult him ahead of Korte in the UMP Summer Nationals point chase to win his third consecutive UMP Summer Nationals title. Schlenk held off Shannon Babb for a third place finish with Brian Shirley ending up fifth. Craig Dippman’s luck has taken a turn for the better in recent weeks as he captured his second UMP Bomber A Main feature win of the year. The top two drivers in UMP Bomber points, Jim Scout and Danny Hogrefe, battled for the lead early in the race, but Dippman quickly marched to the front in the caution-filled race. Finishing second behind Dippman was Jim Scout followed by Danny Hogrefe, Tony Tolles and last week’s Bomber C Main winner Joe Cordes. Next on the track were the youngsters of the UMP Hornet Feature event in which Dylan Herman would lead the most laps. Fourteen-year-old Derek Morris picked up his first ever UMP Hornet Feature win with a late pass over Herman which moved him up to second in UMP Hornet points. Herman held on to finish second in the race over Adam Noonan, Tyler Line and Cody Stetton. Jeff Geis was the first to lead an exciting UMP Bomber B Main. Josh Overmyer took command by lap two and held the lead for a few laps until Dan Dippman made the pass for the lead on lap nine. Overmyer wasn’t done as he continued to pressure Dippman for the lead all the way to the checkered flag. Overmyer got back alongside for the lead and the two drivers crossed the finishline side by side with Dippman just edging out the victory. His third B Main win in the last four weeks. Josh Montague finished third followed by Jim Guinn and Joe Overmyer. Dean Taylor led the entire distance of the UMP Bomber C Main to cap off a great night of racing action at Oakshade Raceway. It was Taylor’s second UMP Bomber C Main win of the year. The rest of the top five finishers were Chane Stuckey, Dan Bleikamp, Brad Brehm and Justin Gamber. Oakshade Raceway will feature the second UMP Late Model Push Truck Dual Features with two UMP Late Model Features each paying $1500 to win. UMP Sportsmen will be back in action after the week off along with the UMP Bombers and UMP Hornets. Gates open at 4pm with racing at 7pm.